Evocative like Billie Holiday, raw-edged like Tina Turner and gifted with an eclectic range of pop, funk and soul in-between, there is no other artist quite like Macy Gray. With roots steeped firmly in the Midwest and dreams that took her from part-time bar and songwriting gigs to a full-fledged recording contract, the former Natalie McIntyre used her voice, literally and figuratively, to embolden and inspire. Some may not have known what to make of Macy's unique vocals and funkdafied, cooler-than-cool persona, but her signature 1999 smash, "I Try," made sure she would remain in demand while they eventually figured it out. Despite Gray's unconventional rise to stardom -- a Grammy Award earned for "I Try" and within three years of her 1999 debut, On How Life is, marked her first big-screen debut with Oscar-Award-winning actor Denzel Washington in the film Training Day -- subsequent years found the divorced mother of three juggling unforeseen fame and fortune, a diminishing industry rep and an addiction to drugs, which blunted her work effort and creativity ("I was a massive ***hole," she told Oprah Winfrey during their 2014 interview). 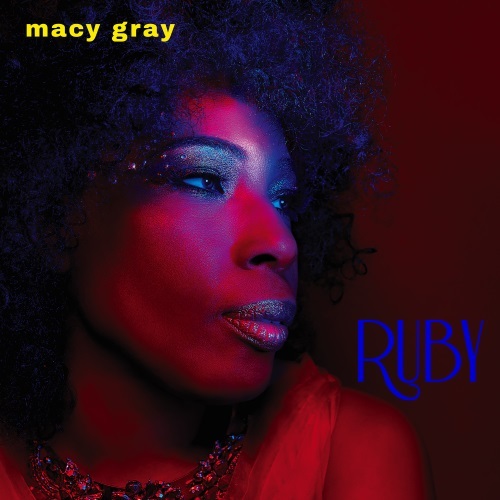 But today, a sober and still-soulful Macy believes she's better for her journey, embraces the gamut of experiences she graduated from and wants the rest of us to do the same, which explains the multi-faceted and sparkly gem that is Gray's tenth CD, aptly entitled Ruby. Macy has more than a few aces up her sleeve with this foray: collaborators like Megan Trainor and Ryan Tedder bring polish and pop sensibilities to the mix while her life's trajectory and sage wisdom (she just turned 51 earlier this month) flesh out the rest. The first single, the Trainor-helmed "Sugar Daddy," is a flirtatious tangy ode to the treat to her boo thang, the one treat she refuses to go without: "They try to tell me to stop, but I want it/I can't give it up, cuz' I want it. And why should I/ when there's so many tasty flavors?" Macy also shares the love in the disco-funk burner "Over You" and drops a Celie-esque curse on the man who's determined to hit the front door in the lilting midtempo, "When It Ends": "You'll say my name when you tell em' of the best you ever had/I'm forever in your brain as the memory you won't forget." Social commentary ("Cold World"), cautionary tales from her puff-puff past ("Just Like Jenny") and even a dab of politics are a part of the mix: it's not hard to figure out who she's describing in her warning to an over-the-top, mouthy bigot in "White Man" (need a clue? The last name rhymes with "dump"), and Macy admits that a union may be downright abusive, even as she stays, in "But He Loves Me." However, no matter how Gray's musical influences vary from one subject to another -- the playful "Shinanigins," the introspective "Buddha" and the powerful, gospel-injected closer, "Witness" -- Gray's self-assuredness throughout sells material that few of her musical peers could imagine having access to, much less dropping hits with. Macy Gray's Ruby is named for more than just a jewel: it describes her polish, passion and the rich, regal countenance she's absorbed since reclaiming her focus and artistry. Save it for special occasions if you want to, but this particular Ruby grows deeper and more beautiful with each listen. And in these turbulent times, we need all the shine and all the Macy we can get. Highly Recommended.